This beer may as well have "For Tim, with Love." 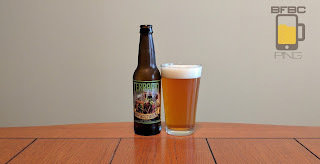 I mean, and IPA with an awesome name like Hopsecutioner from Terrapin, who (when they put their mind to it) can put out some seriously good beers. With the artwork on this label, I'm kind of surprised they aren't getting sued by Eastman & Laird (or whoever owns the Teenage Mutant Ninja Turtles these days). The light amber beer has a remarkably sticky head that leaves lacing like its on sale at the dollar store and leaves a thin cap patchier than Patches, the dog who lives down the street. The aroma is suitably hoppy and a rich mixture of citrus and pine with a solid backing of bread malt. Honestly, I expected the hops to overwhelm the malt, but the malt seems to be holding its own here. 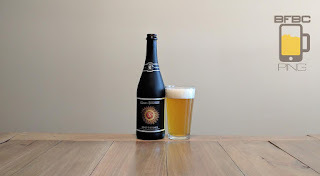 The Ommegang beers I've had in the past have made me pretty much go out of my way to try new ones - I even bought a few for friends and relatives. This latest one comes just before Game of Thrones comes back on, and it makes me want to watch that show just by looking at this bottle. The clear, golden beer cascades very heavily, and it has one of the more resilient heads that I've ever seen. It fell to about half an inch after a soft pour, and it is not going down any more than that. I respect that kind of stick-to-it-iveness. The aroma is floral honey and dusty yeast. First sip is honey sweet and that dusty yeast with even a bit of fruit to straighten things out. As a sip, it isn't overly complex, but it's still pretty nice. I could see sipping this for a while and enjoying it well enough. But swigging is what I do. 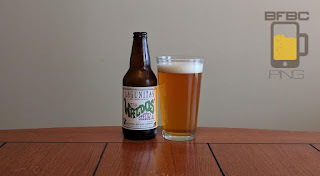 Lagunitas is a tiny little part of a great big corporate macrobrew machine. It wasn't that way when I first started trying their wares, and so far it seems like their corporate overlords have not screwed with their particular and peculiar take on life and the way to make beers, so I still look forward to every bottle of it I get my hands on. The very clear honey colored beer has a somewhat sticky head that leaves a familiar (to those of us who have had a few Lagunitas before) patchy cap. The aroma of funky yeast, dirty grapefruit hops, and vague spices is pervasive. I can't say that it is a particularly nice smell, but smell isn't everything. First sip is better than the smell, but not a far way off. 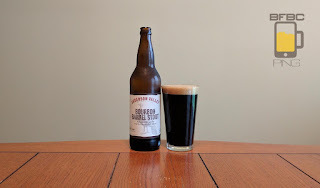 The kind of dirty, spicy, funky taste is more mellow than the smell, and it has so many damn hidden depths that I feel like I'm drowning in flavors that I can't even enjoy with a fairly quick sip. Fortunately, I have a process that figures this kind of stuff out. 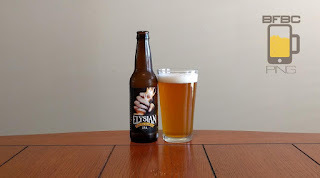 We've been here before, Elysian and I, and their beers have been absolutely sensational. So, when they say that an IPA is "The Immortal" I assume they have done their homework and know what kind of expectation level that is going to bring. If they bring their best, like they have before, then we're all good. 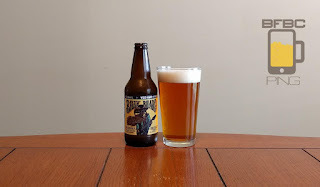 The amber-gold beer has a very nice white head with lacing and stickiness that tells the drinker that the beer is an IPA. The aroma? Well, it isn't as much IPA as the look. It definitely has a heavier malt and yeast in there like a DIPA might. Mind you, I can totally smell the citrus hops waiting for me, so maybe this is going to be an IPA after all. First sip is all kinds of IPA. It is actually fairly nice with its grapefruit all up in my face and the malt managing to keep the bitterness in check. There is orange and mango in there to help things stay rounded out, but that grapefruit is really front and center. Will it be in the swig? I never had a beer with a wax seal before. This one had a wax seal over a cap - I had really expected a cork. The label, even though Sierra Nevada is a big enough company to be known in pretty much every bar in the US, looks like it was printed out on someone's home ink jet printer - 10 years ago. So, it is an odd mix of intimidating craftsmanship and laughable guy cobbling stuff together in his garage. It's a dark brown beverage. I mean DARK brown. The light brown head is really big, as you can see in the picture. As it goes away, it leave a lot of lacing on the sides, and it makes me just want more of the beverage. The aroma is strong enough to hit me from my chair, which is excellent. It has hops galore, a bit of spice, and maybe even some citrus. Bearded Iris started off very, very strong, but they have kind of petered out to the middle-of-the-range beers at this point. All told, I'm still generally happy with their beers, and I would gladly try a new one - which is what I'm doing, so I guess that's proof that I'm not lying. 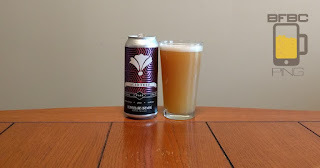 Another yellow-orange juice colored and textured beer from Bearded Iris. The head took some coaxing just to get this little bit, but it sticks to the sides very well. The aroma is fruit, but it is more like a citrus spritzer - all sting on the nose and very little meat to the fruits. First sip is - just as the name suggests - a fairly acidic citrus going on. Grapefruit jumps out and hits me in the face, and I usually actually eat grapefruit with quite a bit of sugar, so this could use something to seriously cut the bite. Still, a sip is looking through a keyhole through a spyglass through a monocle. Let's gulp! Yee Haw has been a nice surprise for a local brewery. The fact is, it is horribly named, but the beer has not been that bad. 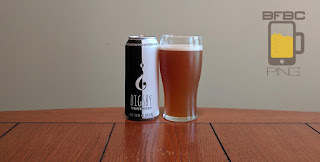 I'm not certain that the nutty name for the brewery should have an effect on the quality of the beer itself, and I have so far found that it hasn't. So, I'm confident that this should be pretty good. That beer is a very darn clear amber-copper color with a semi-sticky head that has floating patches of tiny bubbles centered around much bigger bubbles. The aroma is all kinds of spring lager. I smell spices, malt, honey, and it is a pretty enticing smell. First sip is very, very strong. The honey is pretty solid in there, but the spices are just freaking nuts. No, I'm not saying that I taste nuts, and I would probably not be able to over all those spices. The malt is the only thing really holding its own against the spices, and it is bringing a pretty solid bread.